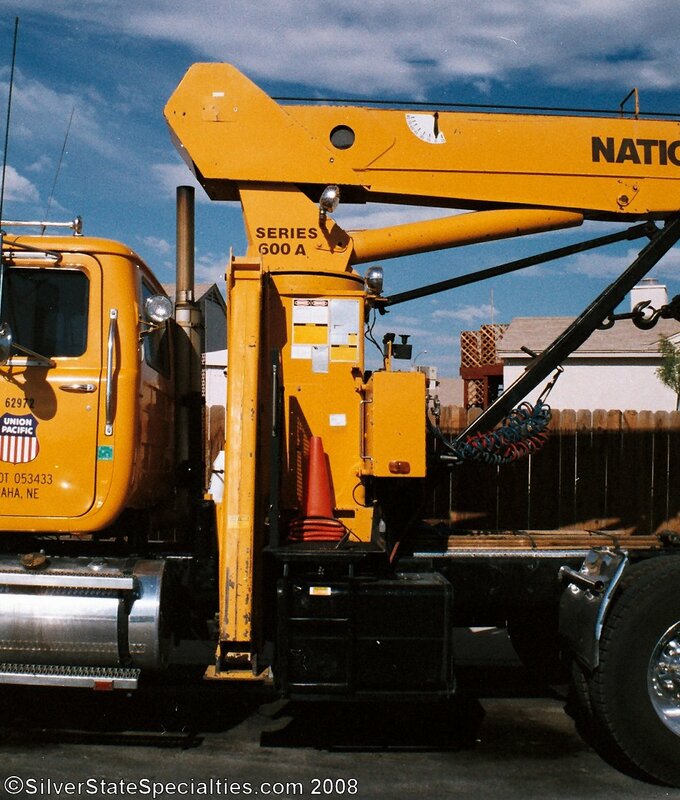 Mack Superliner crane tractor, belonging to the Union Pacific Railroad. Truck was photographed in Las Vegas, Nevada, in the mid-1990s. Photo is scanned from a print. Silver State Specialties was created in 1999 to offer quality resin accessories, replacement parts and conversion kits, suitable for many 1/25-scale plastic model kits. SSS specializes in accessories and parts for plastic model pickup, SUV, 4x4, and heavy truck & trailer kits. 1/32-scale and 1/35-scale parts and accessories will be available in the future for model truck kits, such as the 1/32 Monogram Snap-Tite and ERTL snap-together kits, as well as 1/35-scale Revell, Italeri, AFV Club, Trumpeter, Airfix, Heller, Tamiya, and other military model truck kits. Some of these smaller scale model kits are quite well detailed, and a wide variety of photo-etched, resin, and other accessories are widely available for most of these military truck model kits. What's even more exciting is the line of 1/24th & 1/25th-scale military model kits and conversions we are in the early stages of developing, to nicely compliment your ERTL, AMT, Italeri, Revell, and other brands of truck models. Silver State Specialties is working on resin accessories and complete kits for G- gauge outdoor garden railway trains ("Large Scale") in 1/24th-scale. Some patterns have been completed, and many more are under construction. These kits and accessories will include complete Beyer-Garratt style of locomotives and Narrow Gauge ore hopper cars, as well as 24-inch & 30-inch gauge industrial equipment in this same scale. SSS also has master patterns partially completed for many 1/16-scale model truck accessories and conversion kits, mainly for the Monogram-Revell 1/16-scale model truck kits. Some projected accessories for these 1/16-scale kits are front drive axles, different wheels and tires, air cleaner accessories, pusher and tag axles, oil filters and engine accessories, and possibly different engines. Cab & hood conversion kits remain a possibility for these monsters as well, but are still years away from being offered as there are more pressing projects to push forward with first. But someday they should be available!